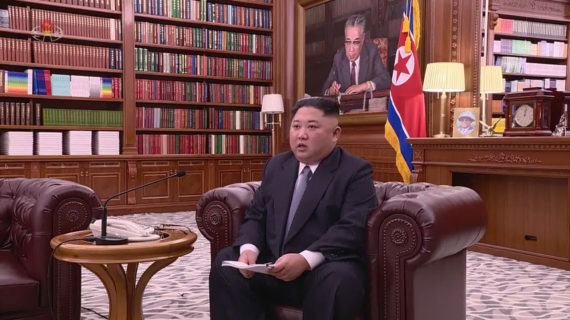 Kim Jong Un’s New Year’s address got a makeover in 2019. Gone was the lectern and flowers in front of a large assembly hall, and in came an armchair and a more relaxed style. 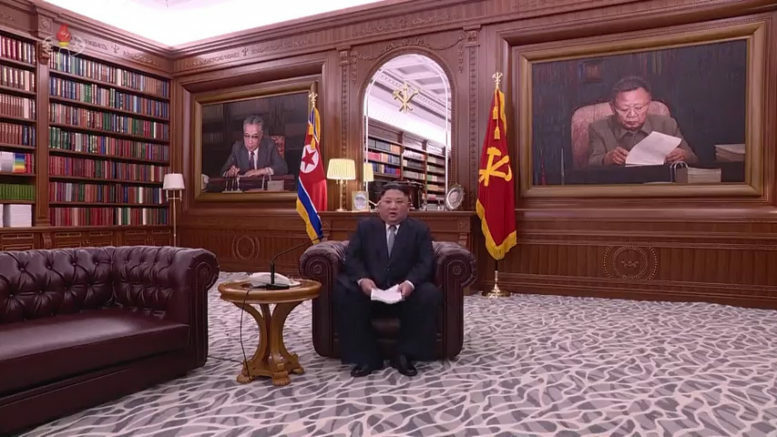 KCTV thankfully got rid of most of the absurd recorded applause that punctuated his speech in previous years, although snippets were still used at the start and end. 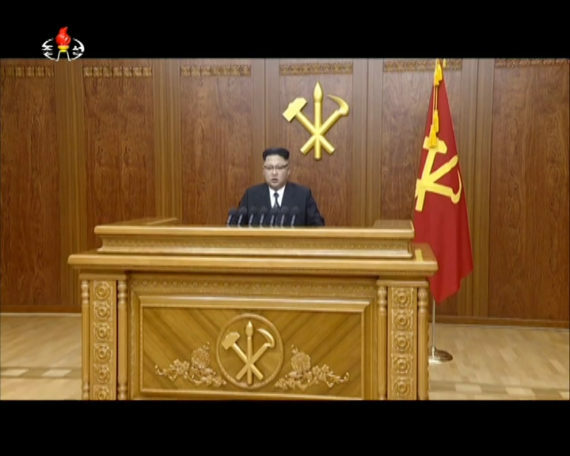 The broadcast was set up with a shot of the clock in Pyongyang striking midnight and then a shot of the central offices of the Workers’ Party of Korea. 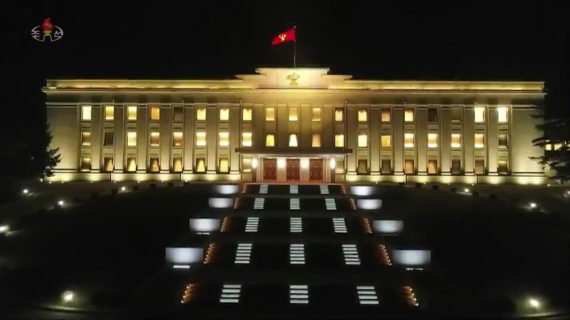 The late-night shot of the Worker’s Party building is a frequently used scene in North Korean propaganda. 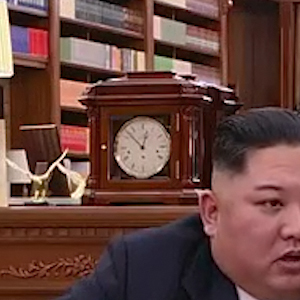 It’s meant to show that even in dead of night, the lights are on and the party is working for the North Korean people. 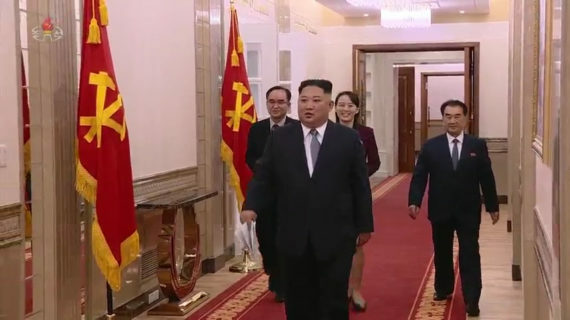 Then, a shot of Kim apparently inside the building, strolling towards the room where he would give the address — another propaganda message for the people. 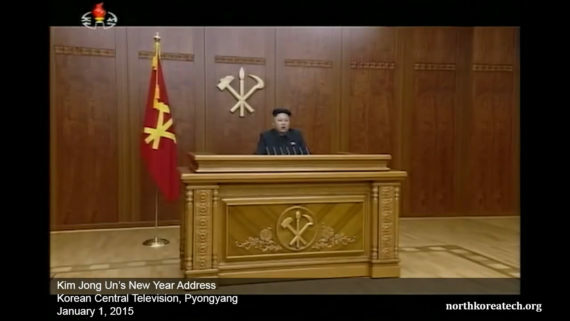 While they were seeing in the new year, Kim Jong Un was still hard at work. The broadcast was recorded with three cameras. One providing the wide shot shown above and a couple on either side for close-ups. To understand what a departure this is from previous speeches, take a look at the style from previous years. This first example is from 2017 but a similar set-up has been used each year since 2013 when the broadcasts started. 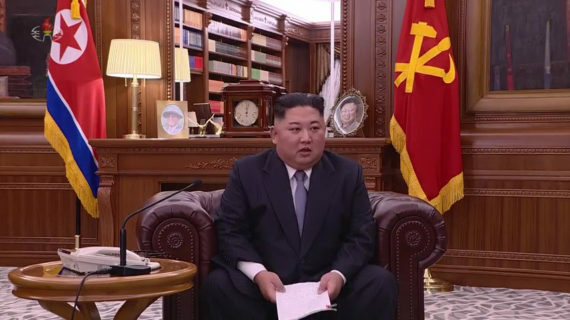 While the sets were consistent during that time frame, Kim did transition from the traditional Mao suit to a western-style suit in 2017. And then there was the clock. Many have noted this oddity, perhaps oversight, already. However, once my attention was brought to it, I couldn’t take my eyes off it. The speech lasted 32 minutes on TV, and was clearly set up to be taking place at midnight. 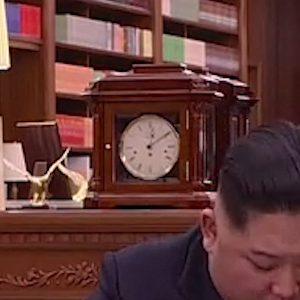 But when Kim finished speaking the clock read a little before 1am. OK, so he messed up some lines or perhaps wanted to put some more emphasis on certain topics. Anyone who has recorded video knows it’s very difficult to do it perfectly. 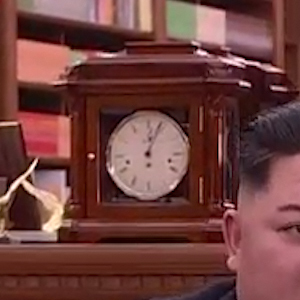 What was more interesting was the way this moving clock was treated. The first time we see it is after about 1 minute and 20 seconds of the broadcast. This is interesting. In those 90 seconds, the minute hand did not appear to have moved at all. It is difficult to determine the precise degree of movement due to the limited resolution of the broadcast, but the movement does not seem to be normal. That was not the only problem. 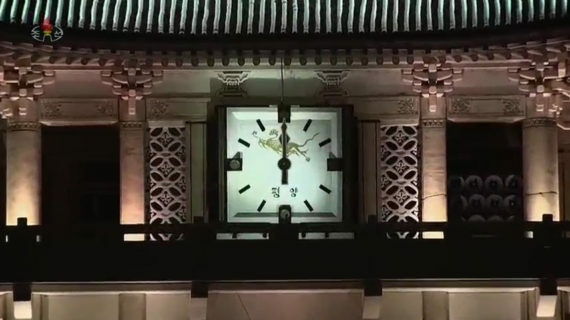 If you look at the close-up of the clock face, at one point the camera moves from side to side ever so slightly but the clock face doesn’t move in the same way. 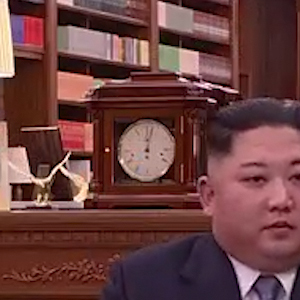 It almost appears as if a video editor has replaced the clock face, although for a few seconds Kim’s face partly obscures the clock face, which would make such a post-production replacement a more difficult job. It could perhaps be down to the way the video compression interpreted the movement, although during that sequence, nothing else in the camera frame, such as the other items on the desk, moved differently than the overall video movement. Back to the clock hands. At 16 minutes and 15 seconds in, it was already about 27 minutes past the hour. However, take a closer look at the hour hand. It has clearly been moved backwards from where it was before and is now only a fraction past the top of the hour, despite the minute hand being at almost half past. At 27 minutes in, the hour hand has moved forward, but only appears to be at the half hour mark, despite the minute hand position. 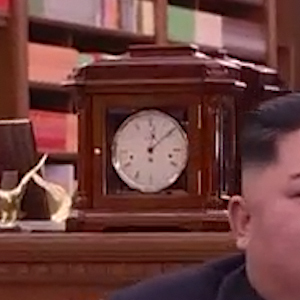 And to wrap things up, a few seconds before the end of the 32-minute speech, the time is close to 52 minutes past the hour but that hour hand is still on the half hour. 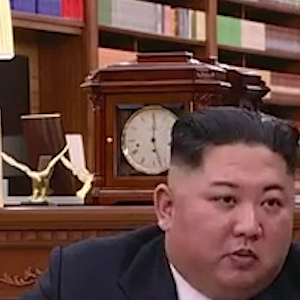 It is certainly a peculiar clock. 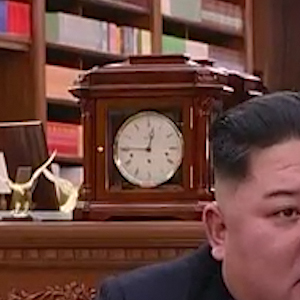 While this year’s set makeover was likely intended to make Kim Jong Un look like a more normal leader, the obvious, yet avoidable problems with the handling of this clock, as well as a few more oddities noted by other experts, seem to suggest North Korea’s propaganda team still has a lot to learn about how to handle Kim’s growing public presence.